Bathymetric data are collected with boat surveys using an automated system and processed in a Geographical Information System (GIS). 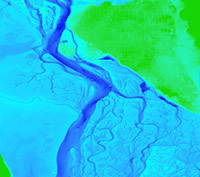 The bathymetric survey data are used to generate topobathy (see below). Water depth maps at various discharge conditions can be produced by overlaying spatial water surface elevation data over the topobathy data. 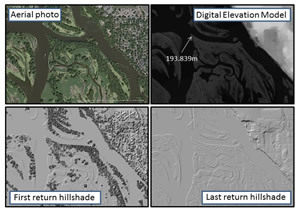 Topobathy data are generated through interpolation of merged lidar and riverbed elevation data derived from bathymetric surveys. The product is a seamless 3D digital model of ground and river substrate elevations.